NEW YORK (CBSNewYork) — Ironically, the hospital is a place where you go to get better — but where you can also get much sicker if you happen to pick up an infection there. But as CBS2’s Dr. Max Gomez reported, there are ways you can protect yourself and your loved ones when a hospital visit is necessary. Heather Brighton had a knee replacement in 2013 and two days later she knew something was terribly wrong. “I started to have bouts and attacks of diarrhea. I was in the bathroom every two minutes,” she said. Brighton picked up a life-threatening intestinal infection called C. difficile, or C. diff, while she was recovering in the hospital from her surgery. “You’re not eating, you’re dehydrated, and you’re just losing a tremendous amount of weight,” she said. It’s estimated one in 25 patients contract an infection from the hospital and tens of thousands die every year from those infections. 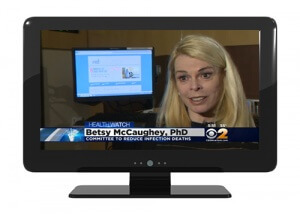 Betsy McCaughey, founder of the Committee to Reduce Infection Deaths, said patients need to be proactive about protecting themselves. Most importantly, make sure everyone — visitors, doctors, nurses, techs — wash their hands before coming near you. “It’s hard to do; patients are intimidated by those white coats and those nurses uniforms, but you can be saving your life by asking them to do that,” McCaughey said. Research also shows wiping down surfaces around the hospital bed with bleach wipes can reduce some infections by as much as 80 percent, Dr. Gomez reported. “Wipe the high touch surfaces. By that I mean the bed rails, the over the bed table, the call button, the television clicker,” McCaughey said. Another ignored potential infection spreader is the stethoscope. Several studies found them to be loaded with germs, even when doctors and nurses wipe them between patients, Dr. Gomez reported. It’s led one company, Stethguard, to develop a disposable sleeve for stethoscopes. “I think hospitals try to make an effort about keeping their hospitals as sterile as possible, but I think more needs to be done,” said Brighton. Other steps patients can take: do a little research and try to choose a hospital and surgeon with low infection rates. And days before surgery, bathe with chlorhexidine soap, which can remove harmful bacteria you may be carrying on your skin, Dr. Gomez reported. As it turns out, your own skin can be a major source of surgical infections.